Creating beautiful pieces of embroidered art is an investment not only in costly supplies, but time and energy as well. Each hard-earned stitch in an embroidery project should be treated with the respect it deserves, whether it is a piece you have created yourself or a vintage piece you have collected. Keeping your embroidered items clean and properly stored will ensure a lifetime of enjoyment. Following these top 11 tips will help keep your projects looking their best. Before washing any vintage or antique pieces, check the fiber content and test the fibers to see if they can withstand washing. Some fibers can't be washed ​in soap and water, and older pieces might not be sturdy enough. To test a piece, crinkle it gently in your hands while holding it up to your ear. On older pieces, you might hear a gentle crinkling noise as you handle the fabric, which indicates that fibers are breaking. Do not wash a piece that crinkles because this will cause further damage and the piece could disintegrate in the wash. Wool fabrics or items embroidered with wool threads (crewel bedding is most often worked in wool threads on a linen ground) should be dry cleaned by an experienced professional to avoid shrinkage or loss of fibers in the wool threads. Silks also should be dry cleaned as color fading with water bathing can be an issue. New projects, especially redwork, also should be tested for dye transfer, also known as crocking. You can easily test the piece by dipping a swab in water and gently rubbing the threads. If the tip of the swab picks up dye, the piece should be washed in cold water and rinsed thoroughly until the excess dye is removed. Do not allow the piece to dry until all traces of rogue dye have been washed away, or it could set in the fabric permanently. Newly completed embroidered projects or vintage linens in good condition that have been worked in cotton embroidery thread on cotton or linen grounds often need just minimal cleaning, or just need to be vacuumed using a clean piece of nylon cover placed over the vacuum hose (worn out pantyhose and knee-high stockings are perfect for this). Heavily soiled items might need a mild bath. Linens that need a thorough cleaning can be freshened easily in room-temperature water with a mild soap like Orvus paste or sodium borate (aka borax) dissolved in water with a ratio of 1 teaspoon per gallon. Allow the piece to soak for 15 to 20 minutes to loosen and release dirt and accumulated debris. Rinse thoroughly after soaking at least twice with clean, room-temperature water. Stubborn stains might need a longer soak, or spot-cleaning with an agent meant to work specifically on the type of stain. Examples of spot-treatable stains include rust and blood, food or grease, and, for example, small pin-head rust marks can be treated using a cotton swab dipped in a rust remover made for home laundry use. Dab the swab directly on the stain and soak again. Rinse thoroughly several times in room-temperature water, making sure all traces of the cleaning solution have been rinsed away. Always avoid using bleach on your linens, as this can damage the fibers or cause yellowing or a pink tinge on fabrics (yes, even whites) that are not meant to be bleached. If gentle cleaning is not sufficient on a white-on-white piece, add just a capful of bleach to the water and swish to blend thoroughly before soaking. Soak linens by gently pressing them down toward the bottom of the sink, or gently swishing and swirling them in the water to fully saturate. Pesky floaters can be weighted down with a water-filled jug. Never scrub the piece by rubbing the fabric together or using a brush. This can damage not only the embroidery threads and fibers, but the base fabric as well, causing a furry appearance that will never go away. Never wring an embroidered piece as this can stretch the fabric making blocking a necessity and can tear or damage fibers in the fabric and thread. Instead, press the water out of the fabric by squishing it against the base of the sink. Smaller items also can be rolled in a plush towel and gently squeezed to release some of the excess water. Dry your linens or embroidery projects flat. An old sheet or fluffy towel is a perfect drying surface. Large pieces can be laid out on a sheet on the lawn. 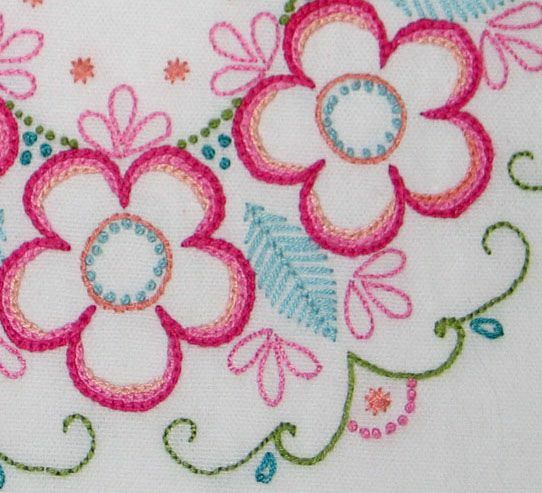 If the area around the embroidered motifs has bunched up around the stitching, gently stretch the piece to flatten (this works with lace edgings that have curled as well). Be sure to stretch in all 4 directions as well as diagonally for best results. Stubborn pieces, or those that are skewed, can be blocked into shape by pinning them to a blocking board while they dry. Items that need to be pressed should be done so while still damp. This will ensure a crease-free finish without the use of sizing agents, such as starch, or misting with water. Items with surface embroidery stitches, such as French knots or padded satin stitch that needs to stand out rather than be flattened by ironing, should be pressed face-down on a plush towel or velvet pressing board or needle board. Remember that pressing and ironing are two different things. When pressing, the iron is lifted from the surface of the fabric before being moved to the next spot. This prevents the weight of the iron from stretching the fabric. Ironing, on the other hand, which is done with a back-and-forth motion, can stretch the fabric and should be avoided. If you do find that the stitching has been flattened after ironing, carefully spritz the stitched area using a spray bottle filled with water (use distilled water if you have iron in your water or hard water in your area). The flattened stitches will bounce right back and the background will remain pressed. Everyone loves a crisp embroidered napkin or tablecloth, but starching before storing can do more harm than good. Starch stiffens the fibers in the fabric, making them prone to breakage when they are folded and stored for long periods of time. Natural starches also attract insects, which will feed on the starch, potentially damaging the fabric as well. Always starch an item right before you are ready to use it. Not only will it be crease-free and fresh, but it will last for generations and remain damage-free. If you've noticed yellowing on your stored embroidery fabrics or finished embroidered items you've wrapped in tissue, or placed directly against the wooden surface of a shelf, your item has been in contact with acid. Acid is common in wood products including both sealed and unsealed shelving and tissue paper. To avoid this problem, line your shelves with acid-free paper and wrap the items in acid-free or archival tissue to keep them safe. Another option is to purchase archival-quality boxes from scrapbooking and photography supply houses for storing your treasures. Large items, such as tablecloths or bedding, are best stored rolled rather than folded. This helps to avoid some of the permanent or hard-to-remove creasing that happens when items are stored without re-folding often. You can order acid-free tubes from shipping suppliers or just ask at your local fabric store. The rolls leftover from upholstery fabrics are the perfect size for rolling and storing larger items. Protect the outside edges of the roll by sewing a sleeve out of washed, unbleached muslin. Slip the rolled item into the sleeve and stand it up in a closet. Sun damages everything—including items that are supposedly UV resistant and fadeproof. The sun finds a way and there is simply no really good way to avoid sun damage other than keeping pieces out of it. Avoid displaying pieces in direct sunlight and rotate your treasures often. Fabrics like fresh air. Airflow prevents the build-up of mold and dirt that can damage the fibers in the fabric and threads used to embroider a project. Avoid storing your embroidered pieces in air-tight plastic boxes. Since this isn't always feasible, especially in areas with high humidity or when storing them for prolonged periods, archival-quality waterproof boxes are available from photography supply and art supply vendors. Also, never frame a piece under glass without spacers. Spacers allow air to flow between the fabric and the glass and help prevent mold, however, your best bet it to display framed pieces without the glass.